Wakefield, MA January 19, 2017 – Nova Instruments LLC is pleased to announce the acquisition of Milford, New Hampshire based Degree Controls, Inc. (www.degreec.com) with its division AdaptivCOOL (www.adaptivcool.com). Degree Controls designs, manufactures and sells high-quality sensors, instruments and thermal controllers, as well as data logging and monitoring software. With over 20 years of fluid mechanics application knowledge and experience, Degree Controls is an industry leader in supplying the Cambridge AccusenseTM family of air flow sensing solutions, ranging from miniaturized chip scale to customized, multi-channel systems for entire buildings. 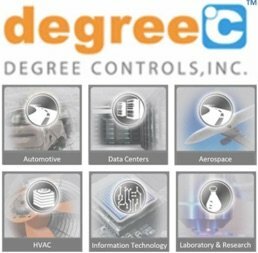 Degree Controls’ AdaptivCOOL division offers unique, turn-key solutions that provide cooling needs to meet the demand of IT data centers world-wide.